I already prepared my gear Thursday evening so I could leave straight after work on Friday at 12:00. The trip took a half an hour longer as the traffic picked up a bit. But finally I checked in to my accommodation. After changing my clothes I jumped back to my car and started the discovery. First I visited the Mumbles to figure out if I can park close to the lighthouse next morning around Sunrise. It turned out that there is a car park next to the restaurant which seemed suitable. I was happy. 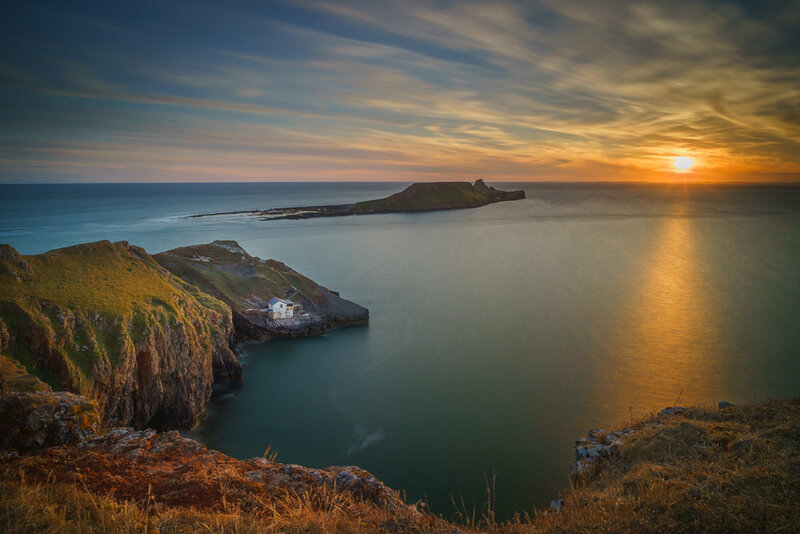 I didn’t spend to much time as my final destination was Worm’s Head in Rhossili. I arrived at the car park (National Trust) around half five. There were lots of people around walking the area. I grabbed my gear and walked out till I reached the Old Coastguard Station. I was looking for compositions. After around an hour walk I identified some and headed back to my car. I sat there for a while and had my sandwiches. An hour before Sunset I walked back and now I took my tripod too. It was a really nice evening people also stayed there to watch the beautiful Sunset. My final composition contained Worm’s Head and the little white shed in the foreground. I found this one the most pleasing where there were strong lines leading the eyes around the picture. I took the shot just around 15 minutes before Sunset when the Sun were still strong enough to light up the foreground. While I was walking back to my car I stopped for just one last shot as the sky was still spectacular. Then I drove back to my accommodation and prepared everything for next morning. Next morning I had to wake up around 4:45 to be at the Mumbles Lighthouse early enough for the Sunset. It was just a 15 minutes drive from my B&B. First I started to take some photos with my Zeiss Loxia 21mm F2.8 but after a shot or two I realised that the composition didn’t work. I move a bit away to see it from a different angle and I attached my Zeiss Loxia 35mm F2 to the camera. That gave me a narrower view which I liked more. I also attached my NISI filters, the polarizer, 3 Stop Soft Graduated ND and the ND1000 filter to smoothen the water. I took a coupe of exposure and finally this one left as favourite.